SamuiBus.com | Book Airport transfer to Chaweng just a few minutes! It is believed that first of all it is the beach for a fun-filled youth. DJ-bars, parties with fireworks, clubs, pubs and hotels – there are in abundance. The shore is dotted with beach restaurants and snack bars which with the twilight coming move out their shelves full of ice with freshly caught seafood for your choice and switch on the colored lights which are hang in the crowns of the trees and palms. Chaweng is the longest and the busiest beach of the Koh Samui island. 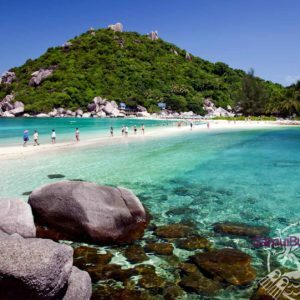 Get from the Koh Samui Airport to the hotel in Chaweng Beach and back will be so easy if you will think about it in advance. Just book Transfer service!